1 lemon, one half squeezed for its juice, the other half sliced thinly. In a small bowl with tall sides, combine sugar with 1/3 cup hot water. Using an immersion blender, blitz until sugar dissolves. (Or use a food processor or blender.) Add 1-1/2 cups of the blueberries and blitz again, until blueberries are completely broken up. Set a strainer over a bowl and strain the blueberry mixture, pressing on solids to extract as much liquid as possible. Discard solids. Pour blueberry liquid into a medium-large pitcher. Cut the remaining 1/2 cup blueberries in half and add to pitcher. Then add cherries, rosé, orange juice, bourbon, Grand Marnier, rosemary, lemon juice, and lemon slices. Stir and place in refrigerator until chilled, about 2 hours. 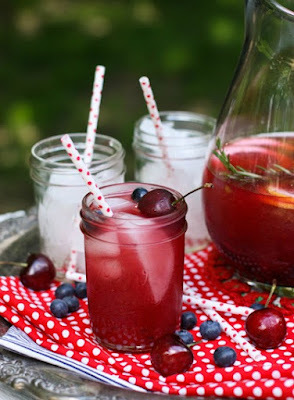 Fill glasses with ice and pour sangria over the ice. Garnish with additional cherries, blueberries, and lemon slices, if desired. This is a Sandra Lee-style super duper easy to make strawberry short cake. 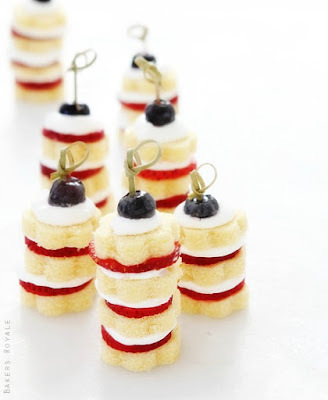 Start with a Sara Lee pound cake stamped out with a daisy cookie cutter, layered with some cool whip, then a strawberry slice and layer as many as desired. 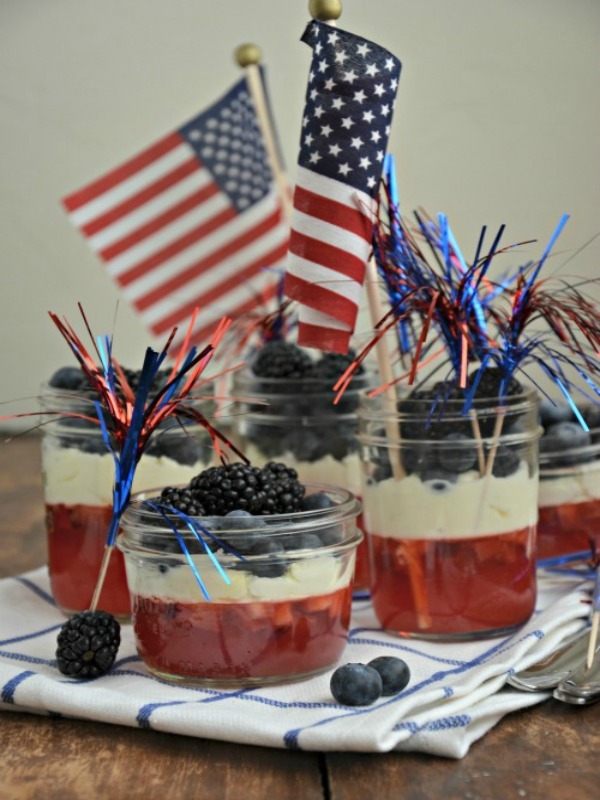 After you have them where you like, top with a blueberry for a 4th of July dessert that’s no fuss, no bake, party fun and party easy. Divide the diced strawberries evenly among the 7 mason jars; set aside while you prepare the Jell-O. When ready to serve, remove from fridge and make the whipped cream. Using a hand mixer, whip the heavy whipping cream in a medium size bowl until it's stiff but not over whipped. Add the powdered sugar and vanilla and stir to combine. Add the whipped cream to the top of the Jell-O in each container using the back of a spoon or your finger to even the whipped cream out and get it all the way to the sides of the jar. Garnish the whipped cream with fresh blueberries and blackberries. Puree the strawberries in a blender or food processor with 1 packet stevia (you will get about 1 cup of strawberry liquid). Pour about 2 tablespoons into each of 9 popsicle molds (it should fill each mold about ⅓ of the way; if you have extra, pour it into the 10th mold). Freeze this layer until solid, or nearly solid for a more “tie-dyed” look. Mix the coconut milk, 1 packet stevia, and vanilla. Pour about 2 tablespoons into each of 9 popsicle molds (it should fill each mold about ⅓ of the way; if you have extra, pour it into the 10th mold). Freeze this layer until slushy (about 10 minutes), then insert the wooden sticks and freeze until solid, or nearly solid for a more “tie-dyed” look. Puree the blueberries in a blender or food processor with 1 packet stevia (you will get about 1 scant cup of blueberry liquid). Pour about 2 tablespoons into each of 9 popsicle molds (it should fill each mold about ⅓ of the way; if you have extra, pour it into the 10th mold). Make sure not to fill the molds over the “fill” line, since liquid expands as it freezes. Freeze the pops until solid before unmolding. 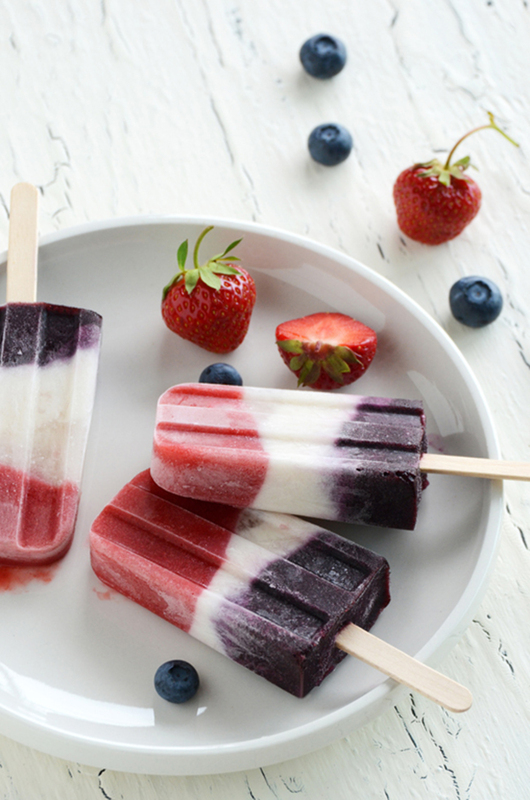 To easily unmold the popsicles, dip the bottoms in warm water and they should slide right out. 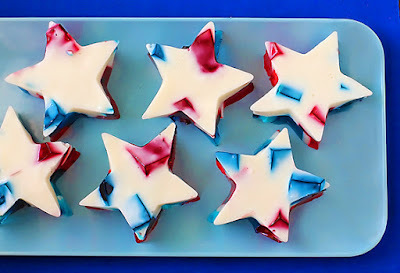 Make a double batch of each flavor of Jello (a double batch using the two boxes of strawberry, and a double batch using the two boxes of blueberry) according to package instructions in two 9x13-inch pans. Refrigerate until completely chilled. Remove the jello and use a knife to cut each batch into small squares (mine were about 1/2-inch). Carefully remove all squares from the pans, then mix and layer the blocks into a new 9x13-inch pan. To make the simple syrups: Combine the frozen strawberries, sugar and water in a saucepan and bring to a boil. Mash the berries against the sides of the pan to release as much juice as possible. Strain the simple syrup into a jar and cool completely before use. 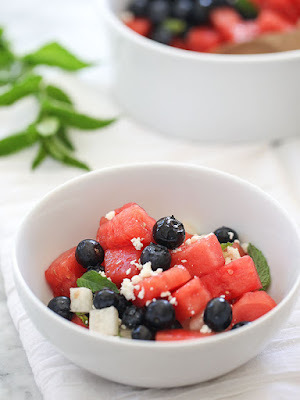 Can be kept in an airtight jar, such as a mason jar, in the refrigerator for several weeks. Combine the frozen blueberries, sugar and water in a saucepan and bring to a boil. Mash the berries against the sides of the pan to release their juices. Strain in the same manner as the strawberry syrup and keep cool until use, in refrigerator. To make the ice cubes divide the chopped fresh strawberries among one ice cube tray, and the sliced fresh blueberries in another. For the strawberry ice cubes add 1 tbsp of the strawberry simple syrup to each cube, and top with water. 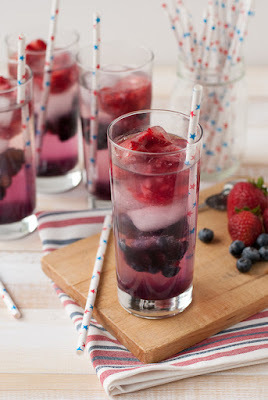 For the blueberry ice cubes, add 1 tbsp of the blueberry simple syrup and top with water. Freeze until ready to use. At least 6-8 hours. For the Vanilla Bean Simple Syrup: Pour the cup of sugar in a sauce pan. Slice the vanilla bean pods in half and scrape out the seeds into the sugar. Rub the vanilla beans with the sugar using your fingertips until the sugar is very fragrant and the seeds are dispersed. Add the pods to the pan and the 1 cup of water. Bring to a boil, stirring to make sure all the sugar is dissolved. Once dissolved turn off the heat and let cool for an hour or two to let the vanilla bean infuse the syrup. Remove the vanilla bean pods and pour the syrup into a jar and chill until ready to use. For the spritzers: Place two blueberry ice cubes in a glass, then two regular ice cubes and finally 2 strawberry ones on top. Add in 1 tbsp of the vanilla bean simple syrup and fill the glass with the sparkling water.